Ordinary hot dogs are transformed into circles on the grill thanks to a clever technique. 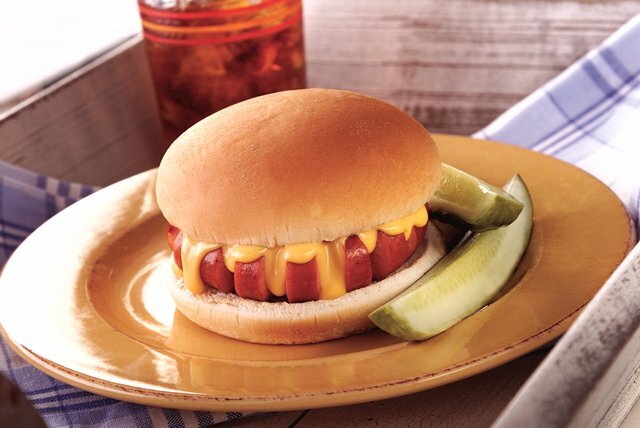 The round dogs are served on hamburger buns with cheese dip. Preheat grill to medium heat. Slice wieners at 1/2-inch intervals, being careful to not cut all the way through the wieners. Grill wieners 6 minutes or until wieners begin to curl and are heated through (160°F), turning after 3 minutes. Meanwhile, microwave the CHEEZ WHIZ as directed on label. Place wieners in buns. Spoon about 2 Tbsp. of the CHEEZ WHIZ into center of each wiener. Substitute OSCAR MAYER Beef Franks for the wieners.